February 21, 2014, 1:10 p.m.
GM (genetic modification) technology might have prevented the Irish potato famine of 1845, new research suggests. Scientists recently announced that a genetically modified variety of Desiree potatos has been developed that is resistant to late blight, the fungus responsible for the potato famine. However, a new poll by YouGov indicates that proponents have yet to convince a sceptical public of the technology’s benefits. Only 6% of the public report their views towards GM foods becoming “more positive” over the last 12 months, virtually identical to the 5% who say their views have become more negative. And as for those whose views haven’t changed at all, they remain decisively negative: 41% negative to 17% positive. 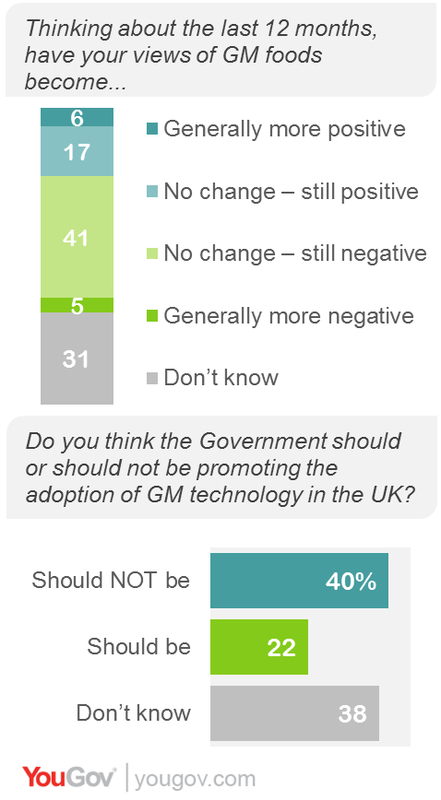 A large proportion (31%) respond “don’t know” when asked how their views on GM have evolved. Additionally, British adults say the government should not be promoting the adoption of GM technology by a margin of almost two to one, or 40% to 22% in favour of such promotion. In fact, the government has shown support for GM and its adoption by British farmers. Environment secretary Owen Paterson said last June that GM foods are probably “even safer” than conventional plants and food, adding that the government and scientific community “owe a duty to the British public to reassure them GM is a safe, proven and beneficial innovation”. YouGov asked both questions in July 2013 and found roughly similar results, suggesting views really have not changed much nearly seven months after Mr Paterson called for increased adoption of the technology. Currently GM foods are regulated by the EU. The crops are common in Britain, but are mainly used in animal feed.